The tradition of J. Kim Martial Arts began over 60 years ago. In 1957, Master Jino Kim's father, Great-Grandmaster Song-Ki Kim, founded a doh jahng(Martial Arts School) at the U.S. O-San Air Force Base (K-55) in Korea. A few years later, in 1961, the Great-Grandmaster opened a doh jahng for Koreans in Song-Tan City. This was the Song-Tan Moo Duk Kwan School, from where our school's legacy began. Just ten years later, a bigger doh jahng was built, not far from the Song-Tan Moo Duk Kwan School. Since the time of the O-San AFB and Song-Tan schools, there have been numerous black belts from that school and from others that became instructors and spread out across the globe. Among these, some became the top Tang Soo Do Masters, founding schools all over the world.In the United States, among these were World Tang Soo Do Association Grandmaster J.C. Shin. Grandmaster Shin was an instructor at the U.S. O-San Air Force Base school at city of Song-Tan. Great-Grandmaster Song-Ki Kim's top student also became the International Tang Soo Do Federation President: Grandmaster C.S. Kim. Another very notable figure was the 2nd American to ever achieve Black Belt: Great-Grandmaster Mariano Estioko. Others in our honorable lineage include Master Young-Ui Min, Master Ki-Hoon Lee, Master Dong-Mun Kim, Master Jong-Su Kim and Master Kwan-Ho Chon. These individuals and others along with them became the roots of the Korean Traditional Tang Soo Do in the United States, including J. Kim Martial Arts. World-renowned actor-martial artist Chuck Norris even came from our Traditional Tang Soo Do roots, having earned his black belt in the U.S. O-San Air Force Base ( K-55) school. The Song-Tan Moo Duk Kwan school also gave us one of their instructors, Great-Grand Master Song Ki Kim's very own son, Master Jino Kim. In 1990, the first international Tang Soo Do Tournament brought Team Korea to competition here in the U.S. Among the competitors was Master Jino Kim. Shortly after the competition, in August of 1991, Master Kim permanently moved to America. From January 1992 until June 1992, Master Kim taught at a school in Reynoldsburg, Ohio. And then, in the June of 1992, he opened J. Kim Martial Arts in Dublin, Ohio. 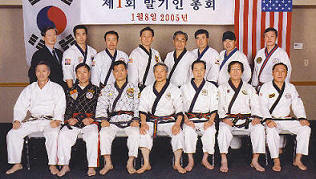 Master Kim opened a branch school in Westerville, Ohio which ran from 1998 to 2003. The Hilliard, Ohio NICC also became the home of another branch from 2006-2008. The U.S National Open Martial Arts Championships were hosted and directed by J. Kim Martial Arts Ohio from 1996-2003. J. Kim Martial Arts US Air Force Base in Arizona in 2000. In 2003, the J. Kim Martial Arts Tucson school was opened, as was a school in the Czech Republic. Other international schools under Master Kim include schools in Italy established in 2006 and in Mexico, established in 2009.